JanJoost van Elburg (1962) finished his studies in choral conducting in 1991. He studied with Barend Schuurman – one of the leading conducting teachers in Holland – at the Conservatory of Rotterdam. Besides that he studied singing with Jelle Drayer (of the Dutch Chamber Choir), Margaret Honig and Luciënne Bouwman, and with Ghislaine Morgan in England. He is conductor of the professional ensemble Descant for early music, the Bartholomew Consort in Oxford, and The Lelikoor (www.lelikoor.nl) in Amsterdam. 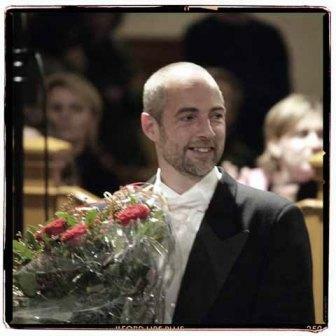 He is a teacher of ensemble technique and training, singing, theory and choral conducting, and teaches on a regular basis at the Dutch School of Arts (Hogeschool der Kunsten). As a singer he has performed with a wide variety of ensembles, including The Tallis Scholars, The Dutch Broadcast Choir, Capella Carolina, Capella Coloniënsis in Cologne, and his own ensemble Descant on several tours. He gives workshops and lectures at home and abroad on invitation – the Summer school of Lacock in England, Spain, Italy and Cyprus; Oakham International Summer School with Peter Phillips and The Tallis Scholars since 2000; Music Camp at High Wycombe – on such subjects as Renaissance & Baroque Music, Madrigals, Flemish polyphony, Tudor Music, and Choral conducting. He is the initiator of the highly successful annual DESCANT International Choral Conductors’ Course (Amsterdam, since 2002).